Last month we went down to Adelaide for a Birthday party and left early in the morning, so that the sun was still low on the eastern horizon when I photographed this beautiful view beside the road. Just had to paint it !! Hope you like it too. 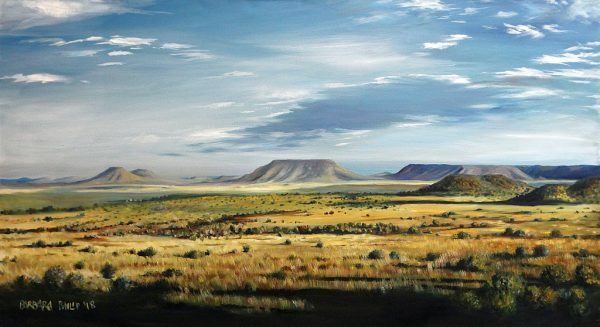 Karoo landscape, early morning, oil on canvas. This entry was posted in Blog, Gallery, Rural Life & Karoo Landscape and tagged karoo landscapes, oil painting. Bookmark the permalink. Post a comment or leave a trackback: Trackback URL.